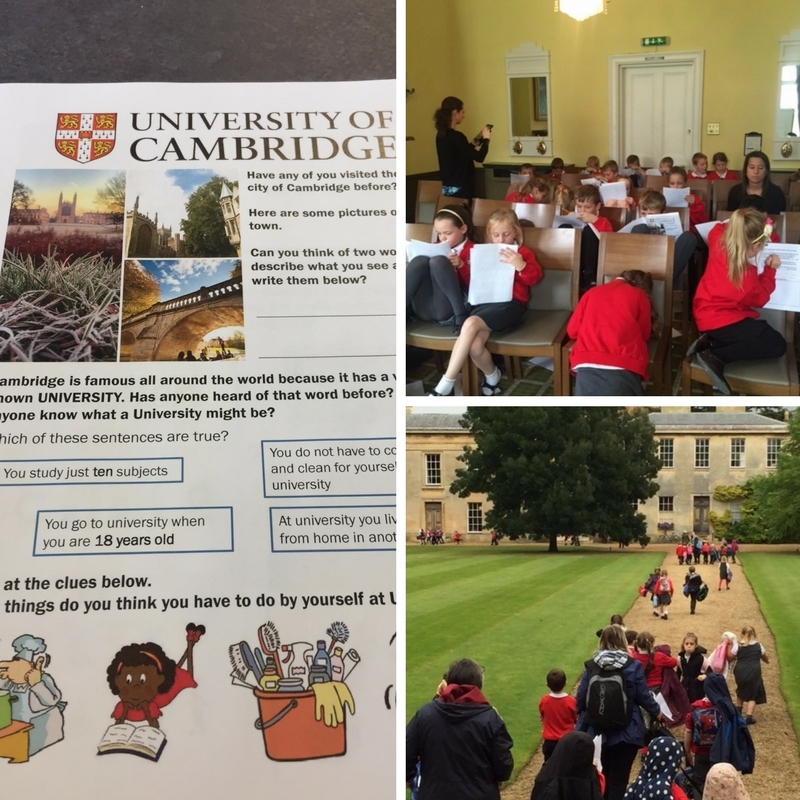 Downing College has worked with a number of primary schools in Cambridgeshire this year as part of its outreach ambitions to inspire students (including those who are slightly younger!) to aspire to attend university. 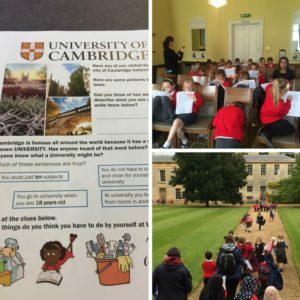 60 Year 2 students from St Andrew’s CE Primary in Soham came to Downing for the day in October 2016. This group of lively 6-7 year olds were from ‘Downing’ and ‘Emmanuel’ class at their school, where all of the classes are named after Cambridge Colleges! The morning started with a tour of Downing College before the main session of the day – completing our Introduction to University booklet. The workbook is packed with fun tasks, including a ‘raise the flap’ section where you can find out what careers can lead from various degrees. All of the students took the booklet home with them to complete their final task, which was to draw a picture of themselves at university. Pupils got a taste of this at the end of the day, when they were able to try on some of the undergraduate gowns that our students have to wear for formal events at the University. Pictures were taken to send home to their families and the students were very excited, even if they could barely be seen through the drapes of fabric! Thank you to Downing and Emmanuel Class for being wonderful visitors and for sending us some absolutely brilliant thank you letters – they were much appreciated here in the office! In February 2017 I also visited the Vine Inter Church Primary School in Cambourne, where I spoke to 30 students in another Year 2 class. Everyone had great answers to the questions in the booklet and worked really well in teams to complete the answers. Towards the end of the session, the students were busy telling me all about their plans for the half term, which included lots of visits to the Cambridge University Museums (we hope you saw some dinosaurs!). Working with primary school students is great fun, as they always have exceptionally high energy levels and tons of questions! To all the teachers and pupils in primary schools I have interacted with this year, thank you so much for letting me talk to you about university – working with primary schools has been one of the highlights of my year and I hope that you will keep visiting us here at Cambridge for many years to come. I studied English at Emmanuel College from 2012-2015, before moving over to Downing to start as the full-time School and College Liaison Officer. 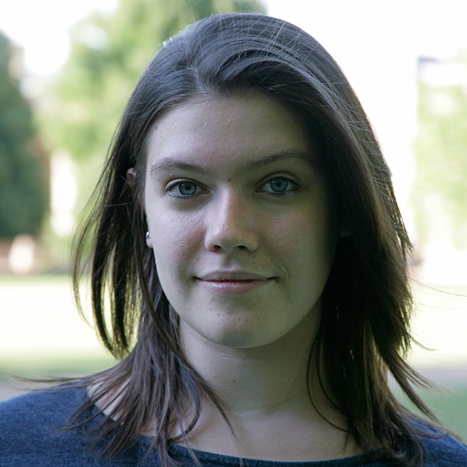 My role involves organising outreach work primarily in the South West, advising both students and teachers in all things related to Cambridge and Higher Education more generally.